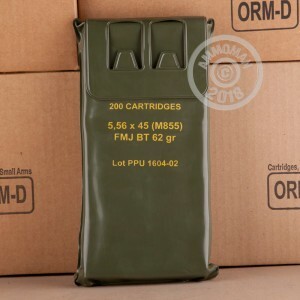 This case of 5.56mm NATO ammo comes in five separate Battle Packs which contain 200 rounds each. The Battle Pack consists of a strong, polyurethane container which forms an airtight seal around ten individual 20-round boxes for storage longevity. Each Battle Back has built-in handles for easy carrying and a rectangular shape which stacks nicely. 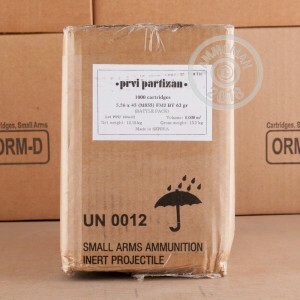 These cases are manufactured by Prvi Partizan which a Serbian company that is well known for making ammo that suits military purposes, exotic hunting, and antique firearms of obsolete chambering. 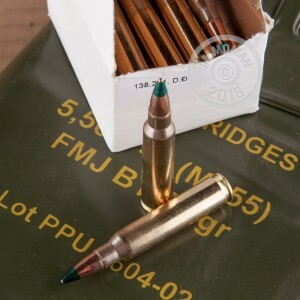 Each of these 5.56x45mm rounds is constructed to the M855 NATO standard and bears a green-tipped penetrator projectile. This full metal jacket bullet weighs in at 62 grains, has a stabilizing boat tail rear, and is capable of defeating limited layers of armor; this ammunition will cause damage to indoor ranges and commercial steel targets and should not be used for those applications. Other components include annealed, reloadable brass casings and non-corrosive Boxer primers which have a ring of sealant that preserves their dependable ignition.